To Cite: Maraghi S, Mardanshah O, Rafiei A, Samarbafzadeh A, Vazirianzadeh B. Identification of Cutaneous Leishmaniasis Agents in Four Geographical Regions of Khuzestan Province Using Nested PCR, Jundishapur J Microbiol. 2013 ; 6(4):e4866. doi: 10.5812/jjm.4866. Background: Leishmania tropica and Leishmania major are the main causes of cutaneous leishmaniasis in endemic regions of Iran. Patients and Methods: 146 samples were collected from the lesions of 146 individuals including 67 (59.59% ) male and 59 ( 40.41% ) female with cutaneous leishmaniasis. The samples were then delivered to Iran- Zamin diagnostic laboratory and smeared on slides, stained with Wright’s eosin methylene blue stain and examined microscopically and graded from 1+ to 4+. DNA was extracted from the slides and the identification of cutaneous leishmaniasis agents was performed using Nested PCR with the primers of CSB1XR, CSB2XF, LIR and 13Z. Results: 138 (94.5%) out of 146 cases of four regions were L. major and 8(5.5%) were L. tropica. 57.97% of L. major cases were male and 42.03% were female. 87.5% of L. tropica were male and 12.5% were female. The maximum number of L. tropica cases was found in the northern region (8.16%) and the minimum was found in the western region (3.22%). 96.78% of L. major cases belonged to the western region of Khuzestan. Conclusions: L. major is the main species responsible for cutaneous leishmsniasis in four geographical regions of Khuzestan province southwestern of Iran and Nested PCR can be used for diagnosis and Leishmania species identification. Objectives: The aim of this study was the identification of cutaneous leishmaniasis agents in Khuzestan province located southwest of Iran. Leishmaniases are known as a group of globally widespread parasitic diseases caused by different species of Leishmania, which is capable of infecting a wide variety of mammals. Currently, 22 species of Leishmania are pathogen for human, infection when exposed to the natural transmission cycle (1, 2). Leishmaniases have been considered tropical afflictions that together constitute one of the entities on the World Health Organization/Tropical six Disease Research (WHO/TDR) list of most important diseases (3, 4). The disease is endemic in 88 countries of 5 continents with a total of 350 -million people at risk and 12 million cases. Among the 88 endemic countries, 22 are in the New World and 66 in the Old World with an estimated incidence of 1-1.5 million cases of cutaneous leishmaniasis (CL) and 500, 000 cases of visceral leishmaniasis (VL) (3). Direct microscopic examinations of stained smears or tissue samples usually used for CL diagnosis, is rapid and easy to use for diagnosis of cutaneous leishmaniasis. But studies in endemic regions revealed that a considerable number of clinically diagnosed cannot be confirmed by microscopic examinations and that methods with more sensitivity and specificity should be implemented in CL diagnosis (5). Polymerase chain reaction (PCR)-based methods have provided the capability of diagnosis and also identification of Leishmania species. Different species may have the criteria for the treatment phase (6). The main biological samples used for diagnosis and identification of CL species by PCR are dermal scrapings or biopsies (7, 8). The purpose of this study was the identification of cutaneous leishmaniasis causative agents in four geographical regions in Khuzestan province, Iran. 146 smears were prepared from the margins of patients lesions referred to Iran- Zamin diagnostic laboratory from four regions of Khuzestan province (northern, southern, eastern and western regions) (Figure 1 ). The smears were dried and stained with Wright’s eosin-methyleneblue and examined microscopically and graded as 1+, 2+, 3+ and 4+, according to number of amastigotes in each high power field of microscope (9). Amastigotes on the stained slides were scraped and DNA extraction was performed according to the protocol of commercial kit (Bioneer, South Korea). External primers CSB1XR (ATTTTTCG/CGA/TTTT/CGCAGAA CG) and CSB2XF(C/GA/GTA /GCAGAAAC/TCCCGTTCA) and the internal primers, 13Z (ACTGGGGGTTGGTGTAAAATAG) and LiR (TCGCAGAACGCCCCT) were used to amplify the minicircle variable kDNA. Two Leishmania species produced the amplified fragments of about 750 bp for L. tropica f and 560 bp for L. major (10). 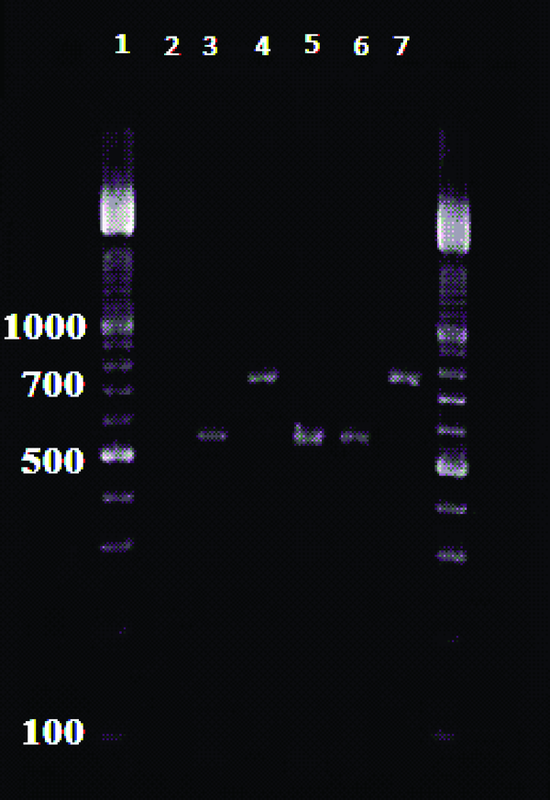 Amplification reactions visualized in 1.5 % Agarose Gel Electrophoresis, using a 100 bp DNA ladder (11) ( Figure 2 ). PCR products. Lane 1: Ladder marker; lane 2: negative control, 3. L. major (positive control); 4. L. tropica ( positive control). Lanes 5 and 6. L. major. L ane 7. L. tropica. 750bp and 560bp bands represent L. tropica and L. major respectively. 87 (59.59%) out of 146 cases were male and 59 (40.41%) were female. Patients’ ages ranged from 10 to 41 years. 138 (94.52%) cases were infected with L.major and 8 (5.48%) patients were infected with L.tropica.Thefrequency of cutaneous leishmaniasis in four regions of Khuzestan province is shown in Table 1 . Laboratory diagnosis of cutaneous leishmaniasis is accomplished by direct demonstration of the parasite by microscopic examination of stained specimens, by isolation of the cultured parasite in the appropriate tissue. Lately, PCR-based methods have proven to be highly sensitive and specific compared to the standard methods and are considered exceedingly valuable for diagnosis (7, 12, 13). In endemic areas where more than one Leishmania Species are present, some diagnostic tools are required for the detection of parasites directly in the samples and the distinction of all relevant Leishmania species(14). Identification of the Leishmania type is important, because different species may require distinct treatment regimens (15). Furthermore, such data are also valuable in epidemiologic studies where the distribution of Leishmania species in human and animal hosts, is a prerequisite for designing appropriate control measures (14, 16). 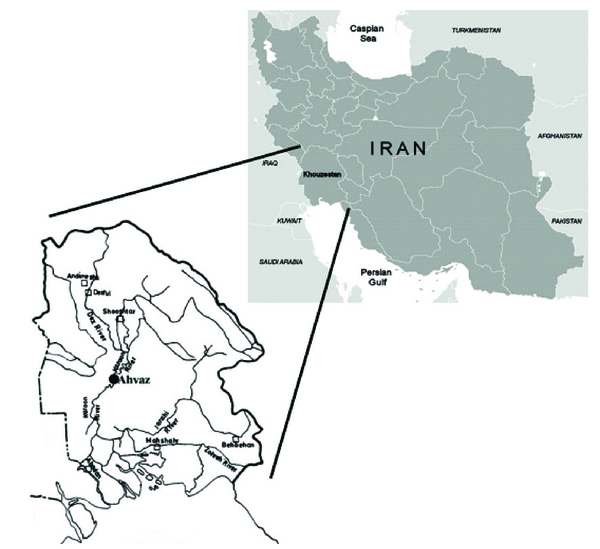 In this study, L.major was the main type of cutaneous leishmaniasis in four geographical regions of Khuzestan province. 94.52% of the cases were L.major and 4.41% were L.tropica. This finding is consistent with the findings of the study conducted by Maraghi et al. in Shush (17) and Ghasemian et al., in Ahvaz (18). Saki et al., indicated that L. major was the main causative agent of cutaneous leishmaniasis (96.6%) using RFLP-PCR and Mini-exon genotyping (19). The majority of L. major cases belonged to the northern Khuzestan while the maximum number of L.tropica cases were found in the western region of the province. 57.97% of L. major cases were found in males and 42.03% in females, whereas the gender-based frequencies for L. tropica were 87.5% and 12.5% respectively. The duration of lesions in L. tropica was longer than L. major. It is concluded that L .major is the main causative agent of cutaneous leishmaniasis in Khuzestan province and Nested-PCR is an appropriate method for diagnosis and identification of Leishmania species. This study is adapted from the Ph.D thesis of Mr. Omid Mardanshah conducted under the financial support of Ahvaz Jundishapur University of Medical Sciences (AJUMS). Implication for health policy/practice/research/medical education: The results of this study indicated that the main causative agent of cutaneous leismaniasis in Khuzestan province is L. major and nested PCR is the best method for diagnosis and identification of causative agents.